On Friday, our niece Jordan took another state championship in the Javelin! She is a 3 time district champion and a 2 time state champion after Friday's win. We are so proud of you and can't wait for another repeat next year! A couple of weeks ago, we all were blessed to have Ryan's Uncle Nick come for a visit from Chicago. It was so great to see him and spend some time just visiting. Bailee and Uncle Nick had one thing in common-their love for ice cream! This was such a great day for me. It started off with the chance to sleep in (which just doesn't happen anymore) and Ryan and Bailee made me breakfast. Ryan cooked me sausage, eggs, hashbrowns and toast. Bailee made the coffee. Ok-she scooped the coffee grinds into the coffee pot and turned the switch on, but I would say that was very good for her. I woke up to Bailee and Ryan in their aprons and she came running down the hall to my room yelling "Mommy, breakfast is ready. Mommy, breakfast is ready." Imagine a little girl running (not walking) down the hall yelling that with big smile on her face with an apron on over her jammies. It was so cute! THANK YOU BAILEE FOR A WONDERFUL MOTHER'S DAY WITH LOTS OF LOVE, HUGS, AND KISSES. YOU MAKE ME SO PROUD TO CALL YOU MY DAUGHTER. I LOVE YOU WITH ALL MY HEART AND YOU ARE GROWING INTO SUCH A BEAUTIFUL LITTLE GIRL! For Ryan's mom, we took some pictures of Bailee and her cousins Jordan & Alex to give their Mamo (that's what they call their grandma). Here are just three of my favorites! Bailee did so good taking pictures. We took these at Aunt Lori's house and she was so excited about the bird bath. That's okay because I think it made such a cute picture! Jordan and Alex are such beautiful young ladies and Bailee just loves both of them so much. Having them live right across the street is such a blessing as Bailee can stand in the front yard and yell at them all the time. It's not just Jordan and Alex, she says "My Alex" and "My Jordan". Happy Mother's Day to all of you mothers. I hope you had just as great of a day as I did with my daughter! We have been remodeling our house for almost 2 years now (since we bought it anyways) and we have finally gotten to the kitchen! Well, since we had to clear out the kitchen of EVERYTHING, we were not able to cook. We are thankful enough for all of our families for having us over for dinner every night this last week so we had a place to eat! While at Papa & Mimi's (Kristina's mom and dad's house), Bailee was able to enjoy the nice weather in their field. She was having so much fun and enjoyed the time with her Papa. During the remodel, our house has been a little messy. Somehow, somewhere (I'm not sure where) Bailee found Mommy's swim goggles and decided she had to try them on. I was suprised she allowed me to take her picture! Easter was a very busy time for us. Bailee went to Mimi's house and colored eggs with her Mimi and cousins, Kyrie and Haylie. Haylie was able to be with us this year from Salt Lake City and we definately enjoyed our time with her (although it was short). We love you Haylie and can't wait for your return this summer. Our weather this year didn't allow our little girl to get dressed up in her precious little easter dress, but that is definately OK. For those of you who know her very well, this outfit was a better fit for her personality anyways. We woke up to a cloudy cold and wet morning so she picked out her outfit for the day. Her choice was her mouse costume and rubber boots. How could we tell her no? She was so cute! Okay, so I am sure that I am a little behind the times in creating a blog, but I thought it would be fun to let everyone know what we have been up to. Ryan, Bailee, and myself all hope that you enjoy reading and seeing how we spend our free time and of course watching Bailee grow right before our eyes! 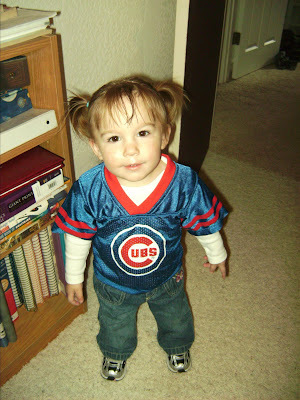 Our family is huge Chicago Cubs fans and so of course, Bailee loves them too. Ryan is trying to teach her the 7th inning stretch song, "Take me out to the ball game....." She can sing parts of it and asks us to sing it over and over again. It can get tiring at times, but it is so cute to watch her sing the words she knows. She loves to eat scrambled eggs with ketchup for breakfast. We ask her if she wants eggs for breakfast and her answer every time is "with ketchup?" Well, one morning she decided to let us know she was done eating in a different sort of way. I turned my back for 2 seconds and this is what I found. Okay, I know all of these are pictures of Bailee, but as all parents know, that is what you take pictures of all the time!